Map illustrating the activities of the 5th West Australian Mounted Infantry in South Africa, 1901-1902. Murray, P. L., Official Records of the Australian Military Contingents to the War in South Africa, pp. 418 - 419. Authority for enrolment was published in December, 1900, and January, 1901. Conditions of enlistment, pay, clothing, and equipment, etc., were as for previous Contingents. Many of the N.C.O. 's and men had served in other Contingents at the war sad a large proportion of the remainder were, or had been, members of Australian Militia or Volunteer Carps, The personnel of these Contingents was, therefore, of a superior character. The 5th Contingent left on 6th March, 1901, comprising - 14 officers, 207 others, with 239 horses. Six officers and 5 others were attached in South Africa; 1 promotion from ranks; 1 officer, 9 others were killed or died; 12 officers, 63 others were struck off in South Africa; 8 officers, 139 others, returned to Australia. The 5th Contingent left Fremantle in the transport Devon on 6th March, 1901, and arrived at Durban on the 28th. The 6th embarked on the Ulstermore, which put to sea on the 10th April, reaching Durban on the 29th. As before stated, after the 6th arrived at the seat of war, both Contingents united, forming vase strong battalion, the command of which was entrusted to Major (afterwards Lieut.-Colonel) J. R. Royston, D.S.O., who had seen the commencement of the war as a subaltern in the Border Mounted Rifles, a Natal Volunteer Corps, and had gained distinction at the defence of Ladysmith. Lieutenant A. J. B. Brown, an officer who obtained experience in the 1st Western Australian Contingent, was appointed adjutant of the combined battalion. They served with Major-General F. W. Kitchener's Column in the Eastern Transvaal., Natal, and Orange Free State; and with Colonel Campbell's, Colonel Benson's, and Colonel Wing's Columns in Eastern Transvaal. 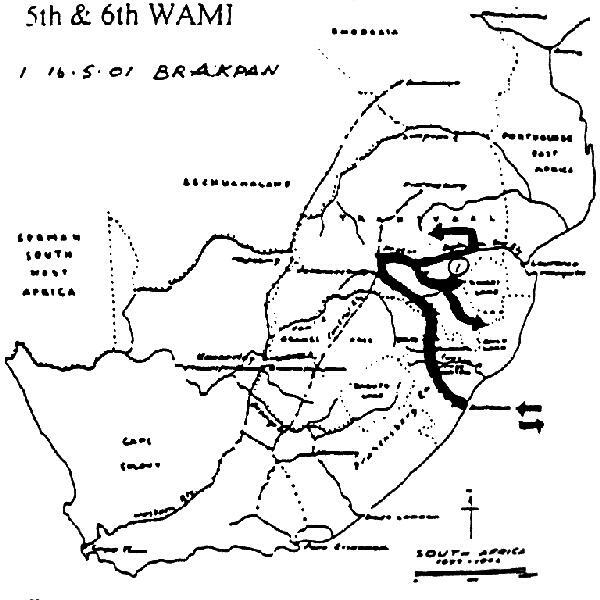 For a great part of the year 1901, the 5th and 6th were in the Column of MajorGeneral Kitchener, who long operated in the Lydenberg district, and generally over the Eastern Transvaal. In April, the Column, working from Lydenberg, took part in the operations of Sir Bindon Blood to the north of the Delagoa railway, and in the Middelburg district. During April, the Western Australians were several times engaged, and made some captures of prisoners and stock. On 13th May, Kitchener's Column crossed to the south of the railway and made for the Ermelo district to take part in another sweeping movement towards Ermelo, under the direction of General Bindon Blood, and back towards the Ermelo-Bethal district. Captain Campbell was complimented by General Kitchener during operations at Form House. On the 15th, there was a severe fight at Grobelaar Recht, near Carolina, in which the 5th had Lieutenant Forrest and Sergeant Edwards and Corporal Bollinger killed, and four men wounded ; and the 6th had four men killed, Lieutenant S. S. Reid and four men wounded, one of whom subsequently died. 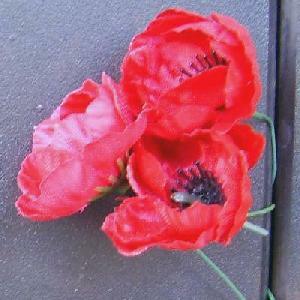 "At Brakpan, 16th May, when retiring through a heavy fire, after holding the right flank, Lieutenant Bell noticed a man dismounted, and returned and took him behind him. The horse not being equal to the weight, hall with them. Lieutenant Bell then remained behind, and covered the man's retirement till he was out of danger." On the 23rd June, at Renshoogte, there was again fighting. Lieutenant Reid and two men were killed, and two wounded severely. During these operations a number of Prisoners, and some carts containing ammunition were taken. In July, Kitchener's Column was back at Middelburg, and after refitting, moved north of the railway, and had some encounters in which prisoners were taken. On the 16th August, there was fighting, with further casualties. Portion of the battalion was from August to October in Colonel Benson's Column, and got in some good work in the Eastern Transvaal. Towards the close of 1901, and in the early months of 1902, both Contingents were acting under General Bruce Hamilton in the Eastern Transvaal, and took part in many of his most successful enterprises. They had a few casualties in various actions, notably at Watervaal River, Rolspruit (where Lieutenant G. A. Mons was killed) and Roodepoort. While with Colonel Wing's Column in February and March, 1902, the Western Australians undertook many arduous marches in the hope of getting in contact with the enemy, but they had been worsted so often that their desire was to hoop out of sight. "in pursuit of superior force of the enemy, near Kromdraai, on 28th February, 1902, he was severely wounded, but with Lieutenant M. A. Shea, D.S.O., 19th Hussars, captured seven of the enemy." "as Corporal, for gallant service on three occasions with scouts, when parties of Boers were taken. Promoted Sergeant by Commander-in-Chief." Both Contingents embarked in the transport Columbian, which left Durban on 7th April, 1902, and arrived at Fremantle on the 29th. Disbanded on 17th May ensuing. Murray, P. L., Official Records of the Australian Military Contingents to the War in South Africa, pp. 421 - 425. The Roll of Honour contains the names of all the men known to have served at one time with the 5th Western Australian Mounted Infantry and gave their lives in service of Australia, whether as part of the 5th Western Australian Mounted Infantry or another unit during the Boer War. Robert ALDAY, Killed in Action, 1 February 1902. William Frederick BOLLINGER, Died of wounds, 18 May 1901. James George DALLISTON, Killed in Action, 1 February 1902. William John DUNSTAN, Died of Disease, 19 February 1902. Frederick Francis EDWARDS, Killed in Action, 15 May 1901. Anthony Alexander FORREST, Killed in Action, 15 May 1901. Richard Joseph FURLONG, Missing in Action, 15 May 1901. Arthur HAMMOND, Killed in Action, 1 February 1902. Robert Henry MCGREGOR, Died of Disease, 20 May 1901. Walter PARKER, Died of Disease, 22 January 1902. Herbert SOLOMON, Died of Disease, 15 April 1901.